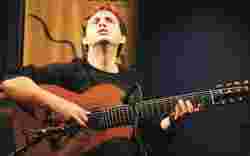 Brazilian guitarist Yamandú Costa is often called a “choro" musician, for lack of a better box to fit him in. The word means “to cry" (or even, “I cry") in Portuguese, which is ironic, given that Costa’s music is so joyous and exuberant. After his participation in the documentary ‘Brasilerinho’ by Mika Kaurismäki on the history and vitality of choro music, Costa has come to be closely associated with the style. But he isn’t convinced that the term fully describes his music. “The film was shown worldwide and helped my career, but choro is not the basis of my style. I’m much more than that alone," he wrote to us in an email interview from Rio de Janeiro. The complexity of his music and his refusal to be so easily categorized stems in part from his own history. Born in Passo Fundo in the Rio Grande do Sul region of southern Brazil, which borders both Argentina and Uruguay (both Spanish-speaking countries), he has melded the Western classical traditions of his early training and the Latin elements that permeate Passo Fundo with the Brazilian styles that are well-known across the world, including bossa nova. That he likes classical music is evident from the fact that he has played with artists such as Paulo Moura, a giant of the choro scene, who was equally at home with classical and popular music. This freedom has shown itself in Costa’s own playing. As he said, “The kind of music doesn’t matter and I play all the time, including at airports, while waiting for flights." He adds: “My new solo project, ‘Mafuá’, my duets with Nana Vasconcelos and my work with the Brazilian Symphony Orchestra are self-composed," Costa said. “In other projects I play Django Reinhardt, Baden Powell, Tom Jobim, Radames Gnattali, Rap-hael Rabello, Caetano Veloso, Ernesto Nazaré, Heitor Villa-Lobos, Mauricio Carrilho, João Pernambuco and others." For his forthcoming solo concert in Delhi, he is slated to present works from ‘Mafuá’, but expect surprises as well, since he said he never adheres to a set repertoire.